Released 19 December 2001. Cover B features Tobey Maguire as Spider-Man. For years, Wizard Magazine was an authoritative, influential and often controversial voice in the comic book industry, for both fans and creators alike. In light of today's news that both Wizard and sister publication ToyFare are ceasing publication effective immediately, with a new "Wizard World" digital magazine scheduled for launch in February, Newsarama reached out to comic book professionals — including several former Wizard staffers — for their reaction to today's news. The greatest Heroclix coverage (checklists, strategy & prices) is only in INQUEST GAMER MAGAZINE. Preview the all-new DC Comics Game & behind the ultimate battle with Marvel Heroclix! Almost 20 years in the making, can 2002's hottest projects live up to its hype? Hype isn't quite the right word - try phenomenon. During the past two decades, a lot has changed about the project - from the writers to the editors to how many issues the series would be. Everything's changed, that is, except for the involvement of artist George Pérez. While company squabbles between Marvel and DC have scuttled the project numerous times, Pérez never gave up on the project he was born to draw. Even when the first attempt at a JLA/Avengers one-shot was scrapped in 1983, for which Pérez penciled 21 pages of the monster crossover, the ultra-detailed-oriented artist didn't give up hope. "This isn't just a big deal for fans, this is the project I've dreamed of doing for 20 years," Pérez stresses. "It broke my heart when they told me it wasn't going to happen the first time. When I got past page 21 this time, I actually took a break and finished off the Chronicles work I was doing for CrossGen so I could be totally committed to finishing Avengers/JLA." 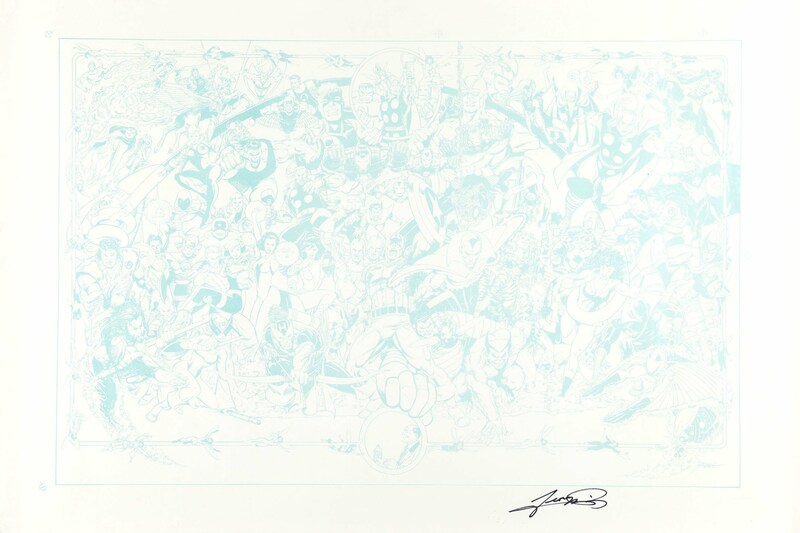 Marvel Editor-in-Chief Joe Quesada made green-lighting the JLA/Avengers project one of his top priorities in 2001, and soon after Quesada took his post, Pérez was the first to step up and say he'd immediately sign on to the most highly anticipated comic project of all time. As some of you may be aware, Spencer Beck is the art dealer and agent of George Pérez (see his website at The Artist's Choice). This is the guy you need to contact if you're interested in getting a special commission piece (from any of the artist on his website). Please note that George is busy with JLA/Avengers and the new CrossGen monthly in 2003. Currently, Spencer is selling the cover to WIZARD #125 via Ebay auction: Ebay Item 1039673577. Starting bid was a minimum of $750, so I am guessing Wizard Entertainment paid a handsome fee of $1,000 for one cover? This is only speculation, corrections, as always can be emailed to me and/or through the guestbook. I just wanted to clarify this matter. 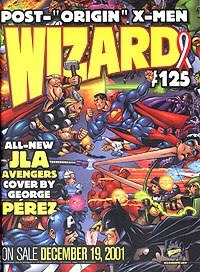 Yes, there was supposed to be a Cap/Superman cover as a third alternate cover for WIZARD #125, but WIZARD changed its mind and opted to save the cover for a later date, most likely closer to the release date of the JLA/AVENGERS mini-series. I myself think that it's a good idea. since I don't want the project over-promoted so early in the game. Tom did do a beautiful job on the coloring and he's really outdoing himself on the inked pages he's already colored. For everyone's info, I'm now on page 36 of Issue 1's pencils. I hope to be starting Issue 2 by the first week of December (if a plot is ready) and will be inking Issue 1 as I pencil Issue 2. > Happy Thankgiving to you as well. Thanks Kirk. Yea he did and I colored it but until Wizard uses it or shows it off somewhere I'm not posting it anywhere. It's their right to use it and release the image first when they see fit to do so. It is sweet though. Wizard #125 is our MEGA 2002 PREVIEW ISSUE! Get the skinny on JLA/AVENGERS by George Pérez, find out about the post-Origin X-Men and the next "nostalgia" wave coming to comics on the heels of the re-hot new G.I.Joe comic from Image! See over 100 of the hottest comics previewed in this issue! Pérez draws an all-new JLA/Avengers cover to this issue! The two upcoming Perez JLA/Avengers covers are for WIZARD #125 (set for release at the end of December), which is Wizard's big 2002 preview issue. I am also drawing a pair of covers for WIZARD's 2002 preview issue spotlighting the JLA/AVENGERS (as DC calls it) project. One version will feature Thor and Wonder Woman; the other will spotlight Captain America and Superman. All in all, my plate is quite full.